This beauty has played the lead in some memorable Bollywood movies such as Kasoor, Bollywood/Hollywood, and Water just to name a few. Lisa Ray has been traveling nonstop from Canada, to India to all over Europe and keeping herself very busy with several projects. Out on the town in France, Loire Valley, she took a selfie. Here you see her in our Goddess earrings in Emerald Green. These vibrant earrings compliment her Green/Hazel eyes so well. Murad Osmann has serious talent! Unfortunately the stunning pictures that were posted on Instagram recently were not published in the book, but I cannot wait go get my copy. The book can be found at Amazon.com. Simply search Murad Osmann. The book is called Follow Me To: A Journey around the World Through the Eyes of Two Ordinary Travelers. Below are the pictures By Murad Osmann accompanied by Natalia Zakharova from their trip to India. They are just too beautiful not to share. See for yourself. Follow them http://www.instagram.com/muradosmann and http://www.instagram.com/yourleo. For now, why don’t you “follow me to…” India. I couldn’t help but throw in a picture taken in our home town, LA! A picture of the newly released book on sale at Amazon.com. And of course, Los Angeles, California. The famous Hollywood Sign. Trishala Dutt is just such a sweet person with an amazing heart. We absolutely love this girl. The photo below is Trishala on a night out on the town wearing our Safari bangle. In the photo below our Evil Eye bangle is featured. Trishala was filming a YouTube tutorial that will release soon. Hair and makeup done by the talented Randa S. of Salon West Dearborn, Michigan. Trishala is wearing her own line of hair extensions called Dream Tress Hair Extensions. You can pick up her extension line at www.dreamtressny.com. Follow her on Instagram at instagram.com/trishaladutt. You can find Randa and some samples of her hair and makeup on at instagram.com/randa_s_.We are so eagerly waiting for the tutorial to release. Trishala is already such a beautiful girl, and she looks absolutely stunning in the photos and videos she posted. Be sure to check them out! We are a proud sponsor of the Imran Khan Live in LA concert, presented by Radio5events. For all you Imran Khan fans out there, he will be performing in Los Angeles on March 6 at Cashmeme, in Hollywood. This is Imran’s first performance in LA. He brought us entertaining and catchy songs like Amplifier, Superstar, Bewafa, and so many more. His latest hit song is from the Bollywood movie Tevar. Radio5events has formed an awesome team for the LA show. Joining Imran Khan are a dear friend of ours, DJ Scorpio, DJ Kamran, DJ K, and KJ Danda. If you don’t come, you will miss out on an amazing show. Get your tickets today! You can buy your tickets at the link below. This is a performance you won’t want to miss. This entry was posted in Uncategorized and tagged Cashmere, Concert, Hollywood, Imran Khan, Indian Pop, Jewelry, Live Performance, Music, R&B, Singer, Sponsor. We are so honored that the beautiful and chic Kyle Richards is wearing Jas&Pal’s Divine earring. These beauties are combination of clear and purple Swarovski crystals in addition to some lighter colored resin crystals. Our Divine earring is available at Kyle By Alene Too in Beverly Hills which is owned by the housewife herself. You can also find them on our website at www.JasandPal.com. Kyle handpicked these from her store and wore them on the forever entertaining show, Bravo TV’s Real Housewives of Beverly Hills. Tune in! 2015 never looked so good. Find out where famous celebrities rang in the New Year! We know most celebrities work nonstop pretty much all year round. Most of us are curious to where know where our favorite stars start off the their New Year. While some celebrities such as Kim and Kourtney Kardashian spent a quiet night at home, most stars traveled to the most exotic locations to ring in the New Year. In the past Vegas and New York City were the place to be for New Year’s, but Dubai and Goa have been this years most popular destination. Check-out the hotspots where some A-listers spent their night and find out which city attracted the most famous people. Kendall Jenner brought in the New Year in Dubai with Selena Gomez, Olivier Routing, and Gigi Hadid. While her sister was enjoying her time in Dubai, Kylie was partying in Vegas with Tyga (rumor has it that they are dating). Sonakshi Sinha is busy promoting her film “Tevar” with Arjun Kapoor. She stayed low key in India. Bipasha Basu and her co-star Karen Grover (who are also rumored to be dating) spent some time together in Goa. This was the spot for several Telly Stars as well. Chrissy Teigen was hosting New Year’s Eve with Carson Daly at Times Square. It was all work for Varun Dawan and Shraddha Kapoor in Las Vegas filming their movie called ABCD 2 with Remo Dsouza, but they surely found time to celebrate on the Vegas strip. Shraddha then took off to be with her mom in New York. Priyanka Chopra took a road trip to a farmhouse in Goa. She has been working nonstop the past year and definitely deserved this break. Karisma Kapoor spent her New Year in Goa with her family. Nargis decided to give her self a new look for 2015 and partied in Mumbai, India. The British babe, Sophia Choudry partied in Pune, India. Sonam Kapoor, her sister Rhea Kapoor, and a few friends went on a camping trip and went on a safari at the Kanha National Park. Eva Longoria and her boyfriend, Jose Antonio Baston celebrated in Cartagena, Columbia. America’s sweetest couple, Giuliana and Bill Rancic hosted a live telecast in Dubai. The telecast was featured on E! This was Pharrell Williams first time performing in Dubai. The beauty Sunny Leone performed in Hyderabad leaving the city for wanting more. She performed the popular song “Baby Doll” and had the crowd grooving. Akshay Khanna and Twinkle Khanna spent their holidays in Capetown, South Africa. Rihanna started off the new year just right and doesn’t stay away from her native islands for too long. She wore her tiny bikinis and was seen hanging out with her friends as they celebrated in St. Barts. Paris Hilton partied with her sister Nicky Hilton at XS Las Vegas. Kyle Richards and her family are at the beautiful ski resort in Vail, Colorado. Riya and Raima Sen partied at the most romantic city in the world, Paris. Ileana D’Cruz was in our hometown, California. She did an appearnce as a showstopper at a party in San Jose. The bhangra singer, Mika Singh, shopped and partied it up Dubai. India’s favorite rapper Yo Yo Honey Singh’s New Years plans are a bit touching. While more people are out parting he spent his night with orphan children. Now that’s a perfect start 2015! Sunny Leone is working very hard to make her mark in India. She has done so well for herself. Sunny is so sweet and extremely humble.We wish her nothing but success with her career in Bollywood. Here she’s in Jas & Pal’s Crystal Treasure Collection. Shes wearing the pearl strand necklace. She wears it so well. Wouldn’t you agree? It’s about that time again. 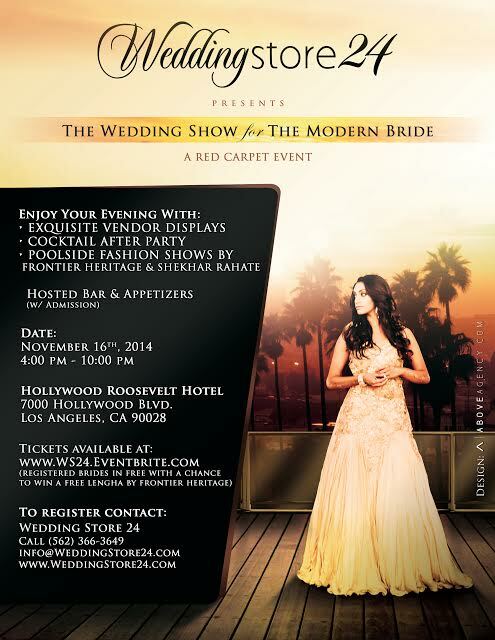 Come join us at yet another grand Wedding Store 24 Event on November 16, 2014 at the Roosevelt Hotel. This red carpet event is being held between the hours of 4pm to 10pm. Come visit us. We would love to see you. 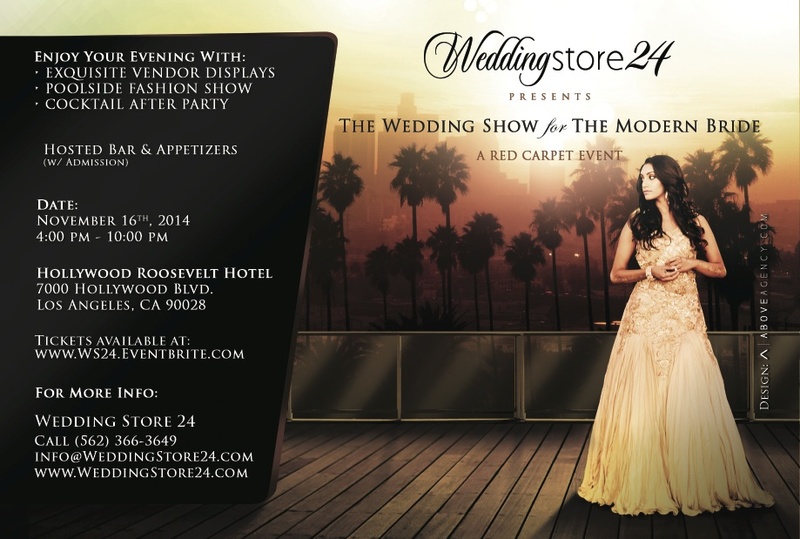 Register for this event at http://weddingstore24.com/events-page. 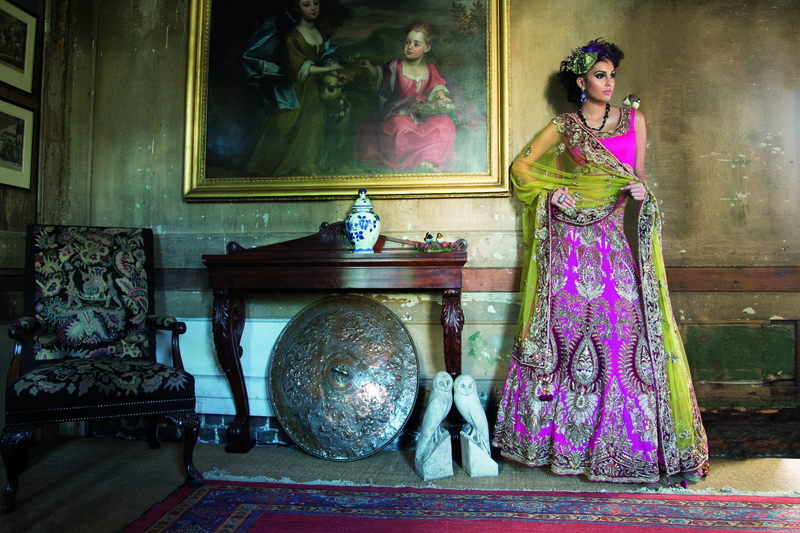 Have you picked up the lastest copy of Asiana Magazine? This edition is Asiana’s Wedding Autumn 2014 Limited Edition. If you haven’t done so already, do it now. This special edition comes in hardcover as well. Pages and pages of wedding coverage, clothing, and jewelry, and much more. The models are wearing jewelry by yours truly, Jas & Pal. Check out the lovely pictures. Asiana definitely has some talented and creative people on their team. Fashion campaign in the Brunswick House for Mongas hair & make-up by Naveeda. This model is wearing the Victorian Gold and Red Stone Kundan Cuff. The lovely headpiece is by Titania Fisher. Who says you cant mix East with West. This unique and gorgeous designer jacket is from the autumn campaign of Ayah Couture. The model is wearing Jas & Pal’s Neptune Earring made of Swarovski crystal element. Again, another beautiful ad campaign by Asiana Magazine. 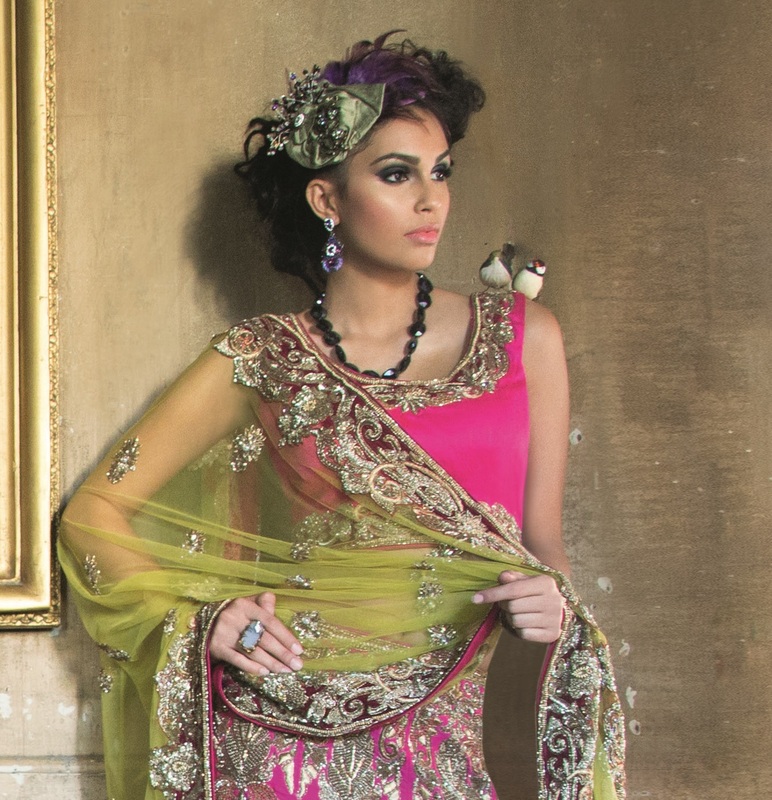 This vibrant outfit was paired with Jas & Pal’s Divine earrings made with Swarovski crystal element. Thank you Asiana for the pictures and credit. Your team did an amazing job displaying our jewels with the remarkable outfits. Meet the new Miss India America 2014! After many weeks of planning the perfect jewelry, outfits, and talent. We woke up to the most amazing news Sunday morning. Our beauty Maya Sarihan won Miss India America 2014. It was such a pleasure working with you and getting to know you. I’m going to miss our texts and phone calls about make-up, hair, jewelry, and outfits. Loved how we changed your sari segment look at the very last minute. Glad you loved the pieces we custom ordered for you. Loved the look on you and so happy everything worked out. You looked absolutely amazing in Jas & Pal. Definitely a proud moment. A huge congratulations to you, Maya!